The Los Angeles County Metropolitan Transit Authority (Metro) released a new app today available at the Apple App Store and Google Play for iPhone and Android devices designed to allow riders to report crimes as they occur on Metro buses and rail cars. “A vital new component in our comprehensive effort to enhance safety for our riders and operators, this smartphone app allows the public to assist law enforcement by reporting suspicious and criminal activity in a timely manner,” said Metro Board Chair and L.A. County Supervisor Mike Antonovich. 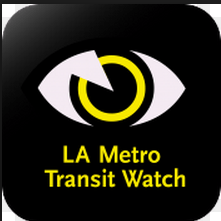 Once patrons download “LA Metro Transit Watch” patrons can report incidents that require law enforcement’s presence and crimes that may occur on board Metro buses and trains. The user can be connected by telephone to the Sheriff’s Dispatch Center or send a photograph via email to deputies and other law enforcement staff. Metro has a contract with the LASD as the official law enforcement agency for Metro bus, rail and real estate properties. Of course, passengers can always push the “emergency” button on rail cars and within stations and speak to someone if they see something questionable occurring. Cell phone access is not available on Metro subways and the underground portions of the Expo and Blue lines. Metro is currently seeking a contractor to provide Wi-Fi in these areas. In their press release, Metro noted a lower-than-average rate of reported crime on Metro property. Incidents of serious crime are .30 per 100,000 boardings. As for the high-profile attacks on Metro employees, they were solved quickly thanks to vigilant passengers. There is another benefit for Metro passengers. Using the app creates a quick and easy way to create a paper trail if one observes a Metro employee or member of the Sheriffs Department acting poorly or illegally. For example, earlier today I was carbon copied on an email sent to Metro CEO Art Leahy about a bus driver honking at a bicyclist in an aggressive fashion. While Leahy quickly responded that he would look into the incident, your average Metro rider doesn’t have the Metro CEO’s email address on hand. “LA Metro Transit Watch” creates an electronic paper trail nearly as good. Users of the LA Metro Transit Watch app with suggestions for improving it are encouraged to send their ideas to customerrelations@metro.net and write METRO TRANSIT WATCH in the subject field to call attention to it. Can you take video with the app? Can we report sheriffs standing around talking while people jump the tunstiles? “…people jump the tunstiles” – never seen this happen since no one ever USES the turnstiles. Everyone uses the wheelchair/bike/baby carriage access. I literally stand and wait with my bike until everyone has exited through that one single opening. They should have just made them all wheelchair/bike/baby carriage access. The MTA is trying to become the creepiest transit system in the U.S. – and succeeding! How about establishing cell service in the bloody subways? That way we can report crime without booting up your tattle-tale app that probably works as well as tap2go.net (that is, it doesn’t work at all). Try and do anything with a phone or camera around a sheriff and see how fast you get hassled about it. Why do bus riders get studies - while drivers and rail riders get plans and projects?